Joanne Bamberger checks in on the Hillary Paradox. Does anyone feel just "eh" about Hillary Clinton? The emotions about the presidential candidate seem to run the gamut from adoration to detestation, with few stops in between. 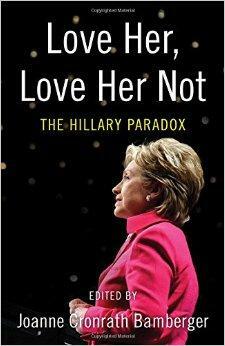 A number of writers explore the Hillary phenomenon in the book Love Her, Love Her Not. The essays have been corralled by editor Joanne Conrath Bamberger, who joins us with perspective on the book and its subject. We revisit our interview with Dan Balz. Before we get completely carried away by the latest on Donald Trump's mouth and Hillary Clinton's server, can we pause for just a moment? The White House race for 2016 is plenty interesting, but it's not even 2016 yet. We take a look back, revisiting an earlier interview with Washington Post Chief Correspondent Dan Balz. He is the author of Collision 2012, a book about the internal workings of the campaigns in the last presidential election. Remember Obama-Romney and the greatest hits of that race? Rick Shenkman looks at our brains on politics. And finds them lacking. Rick Shenkman has already made some money underestimating the intelligence of the American voter*. His 2008 book is called Just How Stupid Are We? Apparently, he's still looking for an answer to that question, or at least getting lots of responses to it. Note the picture of the swinging monkey on the cover of his latest book, Political Animals. There might be an evolutionary reason for the way we make choices about political leaders.